A L Vijay's film Thaandavam caused a lot of expectations amidst the fans, espcially since the director's previous two films Madrassapattinam and Deiva Thiirumagal were a big hit with the audiences. 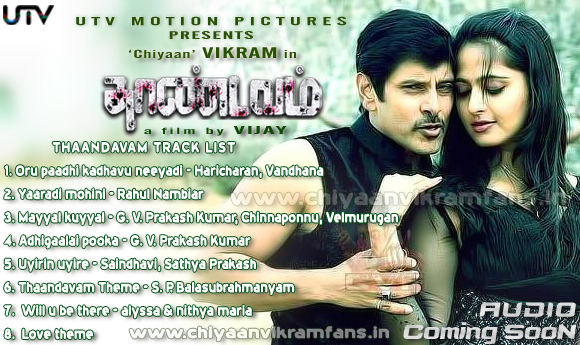 The film stars Vikram, Anushka, Amy Jackson, Lakshmi Rai and Jagapathi Babu. With the shooting for the film finally complete and the makers busy with post-production and publicity work, the audio launch is the next most awaited announcement from the fans. While the first trailer too hasn't yet hit the screens, here's what the tracks from the film could look like. The music for the film has been composed by G V Prakash Kumar. It is expected to be out on the stands in August. And the makers have already announced that they are looking for a really large venue to accomodate the fans.